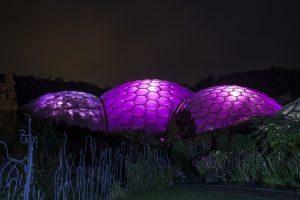 Last night (Wednesday 21st October) a selection of the UK’s historic landmarks joined forces with some of the nation’s finest pieces of modern architecture to light up pink for Breast Cancer Awareness Month’s leading fundraising campaign, wear it pink. 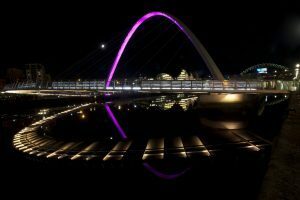 Onlookers in cities and towns including London, Cambridge, Birmingham, Newcastle, Nottinghamshire’s Newark, Liverpool, Brighton, Scotland’s Falkirk, Chester, Derry, Northampton, Isle of Man’s Douglas and Cornwall’s Bodelva were treated to stunning pink illuminations to help raise awareness of wear it pink, which raises vital funds for the UK’s largest breast cancer charity, Breast Cancer Now. A mixture of the nation’s beautiful historic and more modern landmarks including The University of Cambridge’s Corpus Clock, HMS Belfast, Selfridges Birmingham, Library of Birmingham, Trafalgar Square fountains and 20 Fenchurch Street’s Sky Garden (Walkie Talkie) shone pink throughout the evening in a bid to remind everyone to support our renowned fundraiser, wear it pink day, which takes place tomorrow, Friday 23rdOctober. Other landmarks across the UK included The Eastgate Clock – Chester, Derry Offices of the Derry City and Strabane District Council – Northern Ireland, The Falkirk wheel – Scotland, Brighton Wheel, London’s Tower 42, Granary Square Fountains at King’s Cross, Newark Castle – Nottinghamshire, Gateshead Millennium Bridge – Newcastle, Isle of Man’s Tower of Refuge, Port of Liverpool Building, Avon Cosmetics HQ – Northampton and Cornwall’s Eden Project and St Michael’s Mount. 2015 marks a special year for wear it pink, having raised an incredible £27million since it began in 2002 .The campaign is now launching for the first time for new charity Breast Cancer Now and it’s bigger and pinked than ever!